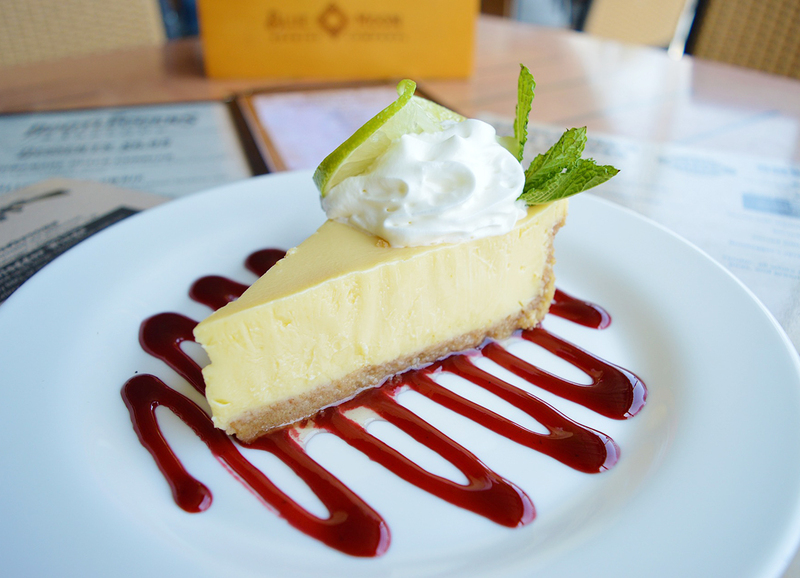 A Quest for the Best Slice of Key Lime Pie in the Florida Keys. My quest for the best slice of Key lime pie started in Islamorada Florida, and ended in Key West Florida, with stops in between. This is by no means a complete list, or a list that covers all of the Florida Keys. Here are the pies I tried, from my favourite to my most favourite… because none of them were bad. I have given a very brief description of the pie, and my thoughts on how they tasted. The 6th slice of Key lime pie I tried from No Name Pub was very light and fluffy. It had the consistency of a banana cream pie, and tasted like it had whipped cream in the filling. The crust was tasty. Still quite delicious, but not the consistency one would expect from a Key Lime Pie. The 9th slice of Key lime pie I tried was quite tasty, but quite a stray from tradition. The Oreo crust and pieces in the filling, while quite delicious, overpowered the rest of the pie, and took away from he tartness you come to expect from Key lime pie. However, I would still recommend saving room for this sweet treat after dinner at First Flight Island Restaurant & Brewery! The 3rd slice of Key lime pie I tried was at Keys Fisheries, and it was quite good. The raspberry swirl in the pie was tasty, but overpowered the lime. The pie was very tart, which is good, and the crust was nice. The 5th slice of Key lime pie I tried was at Faro Blanco Resort, and it surprised me. It was firm, tart, and had a good crust. There was no topping. When I asked if they made it in house, they said, “no, we order it from Sysco.” For a food company pie that is shipped out, it is quite good! I had a lot of hope for the 10th slice of Key lime pie I tried. The Key lime pie at Blue Heaven has a reputation of being the best around – the “Mile High Key Lime Pie”. It was quite good, but I found the merengue was just too much, and quite difficult to eat. For me, it took away from the awesomeness of the tart pie below it. With a lot less merengue, it would have rated much higher for me. The 8th slice of Key lime pie I tried at the Key Lime Pie Bakery was almost perfect. The crust was a nice thickness, the filling was firm and tart, but it lacked a topping or presentation. The 2nd slice of Key lime pie I tried was at Keys Fisheries, and it was very good. The pie filling was very tart, which is good, and the crust was nice. Eating from a plastic container instead of a plate took away from this experience. The 1st slice of Key lime pie I tried while in the Florida Keys was at Marker 88, and it was like music in my mouth – it was signing a chorus of “you have arrived in the Florida Keys”! The pie was more sweet than tart, and the merengue was quite thick, but it had the perfect amount. The merengue was not overpowering. A great slice of pie! The 7th slice of Key lime pie I tried was at Kermit’s. I had heard great things about his Key lime pies, and I walked in with a certain expectation. Well, Kermit did not disappoint. The pie was tart, the crust was amazing, and the small amount of piped whipped cream on top was just enough. The 4th slice of Key lime pie I tried in the Florida Keys was at Chef Michael’s, and it was the best slice of pie I have ever had, let alone the best Key lime pie I have ever had. The crust was a perfect thickness and taste, the filling was nice and tart. The whipped cream, strawberries, and strawberry coulis on the side complemented the Key lime pie very well. After taking the first bite, I swear I could hear a church choir singing the “Hallelujah Chorus” on Easter Sunday. It was that good! While not a traditional Key Lime pie, this tasty mousse at Lucy’s Retired Surfers Bar & Restaurant was absolutely delicious! Whipped cream and key lime pie filling mixed into a mousse, with crushed pistachios and graham cracker crumble swirled in, topped with whipped cream, and served in a Mason jar. You will have a hard time not trying to lick the inside of the jar – it’s that good! Winner, Winner, Key Lime Pie For Dinner! Well there ya have it! Out of the 10 Key Lime pies I tried, Chef Michael’s was the winner. The race for 2nd, 3rd, 4th, and 5th was quite tight, and it was really tough to put those in order. Congrats to Chef Michael’s, and all of the other restaurants. I would order any of these Key lime pies again, as none of them were bad. A big high five to Lucy’s for their Key Lime Mousse. If you are at any of these restaurants, give the Key Lime Pie (or mousse) a try. You won’t be disappointed!